Looking for a little advice for my next steps. 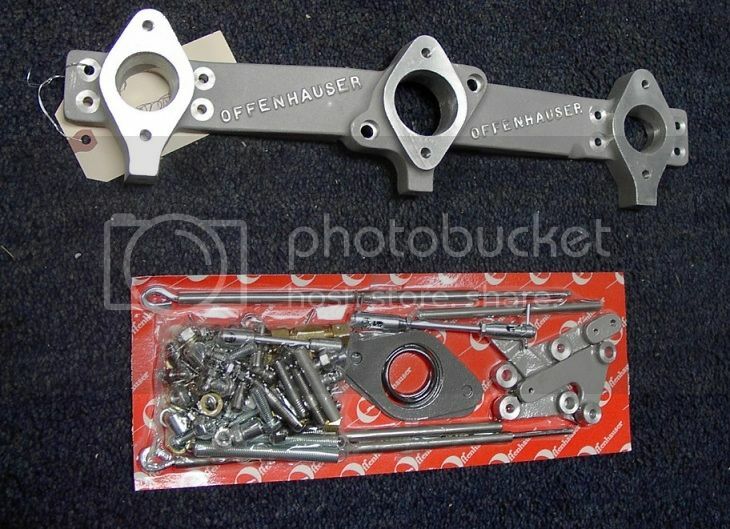 I was able to purchase a Offy manifold that came with three Holley 1904’s, I also have on the shelf two Carter YFA’a. Which would be the better set up, the Holley’s or Carter’s? (I have a 200ci, large log) The center Carter would have a hot air choke while the center Holley would be a manual choke. I also think the Carters will flow more CFM although I could not find any data on the Holley's. All input welcome!! either would be a good set up, and yes the carters do flow more than the holleys. 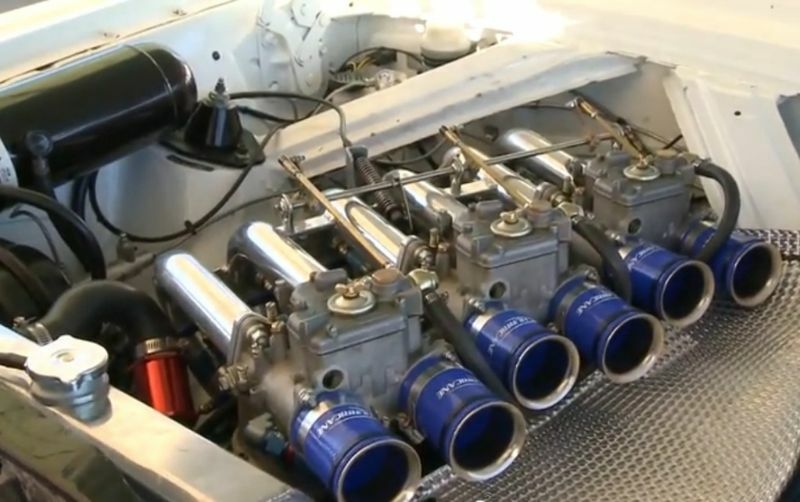 one thing though, be sure to match the carbs, IE use all holleys or use all carters, dont try to run a single holley and two carters otherwise you starve the center cylinder compared to the outer ones. the reason for the three carb set up is to get more and better airflow to the outer cylinders. X2 there could be lots of different carbs used on that intake, Holley's 1904's, 1940's, the Carter YF's, Weber ICE's, Autolite 1100 or 1101's. you could also use a different center carb on a progressive linkage system. I am hunting for the Holley's for mine going for the older vintage look. Good luck on your tripower. Just curious K, What distributor will you be using? Will you be running vacuum advance? Personally I love to looks of the Glass bowl Holleys. Right now I have two dizzy's, a standard dizzy with pertronix and vacuum advance that I'm running on my daily driver and a DUI. I've not got that far, I may not use either. I like the idea of the glass bowl Holley's but I just don't know yet. I looked over the Offy last night and compared all the inlets, they are two different sizes, the outers are smaller than the center. 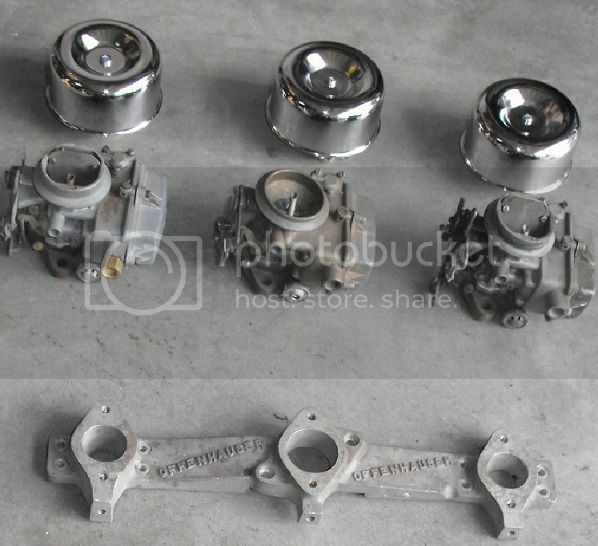 All the carbs are the same size, the Holley's fit the outer inlets while the Carter's fit the center inlet. I agree that all the carbs should be the same, which ever way I go. I appreciate all the input! Anybody have a good source on Holley carbs, 1904 variants? I'd like to see if I can get a center carb with a larger outlet and the hot air choke. My center carb is a little different than the outers but they are all 1904's (I believe). To give everyone a better idea of the setup, I've uploaded a pic. I believe these are 1904's. Thanks for the pic (We Luv Pic!). Looks like a tight fit, no glass bowls? Is there alot of machining to be done to fit that intake? Cool it will fit on the newer log (thought it was only for the pre '77). Who has your linkage? Is that Offy too? Yes, the log will need to be machined. I'll have to source the glass bowls if I go with the Holley's. The glass fits right on the back of those shown? the 1904s? If the cork original gasket rot w/the high alcohol gasoline what could I use now? < 0 > & < 4 > no longer transposed. Last edited by chad on Thu Aug 01, 2013 6:51 pm, edited 1 time in total. Yes, they use the same screws with metal clips. The originals are hard to find but they look really neat. The glass fits right on the back of those shown? the 1940s? kboldin wrote: Yes, they use the same screws with metal clips. The originals are hard to find but they look really neat. kboldin wrote: To give everyone a better idea of the setup, I've uploaded a pic. I believe these are 1904's. ... well (AFAIK), the center carb in the pic looks to be a 1904 used on Dodge, Ford, IH, NAsh/Rambler cars and trucks and others for @ 25 years, the outers look to be 1908's ( 1909's?) with similar specs but squarish airhorn/choke used in 60/61 Comet for example. 1904/08 series has either 'big' or 'small' venturi's depending on OEM application/CFM needs and match the Offy adapter's 'big' inner port and 'small' outers (1.00/1.10/1.20). The CFM range of 1904's varies widely but can be coarsely divided by throat size (1-7/16 vs 1-11/16). YF's also have a wide range of applications with different mfg's. 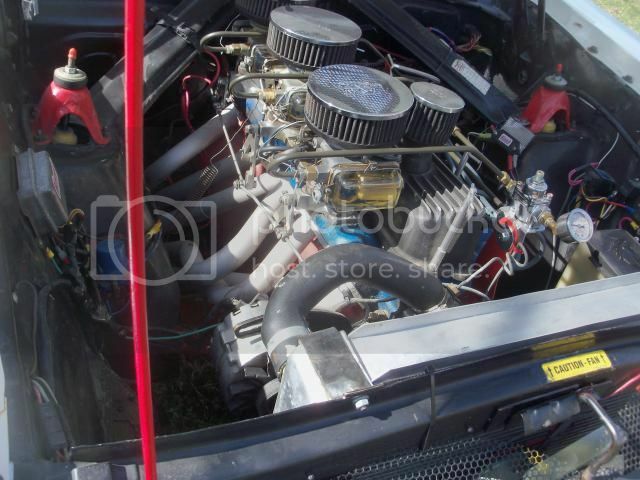 Exact OEM specs are determined by the "list number" on carb side but of questionable worth. The glass bowl types are visually most desirable and typically most trouble, glass bowls are available and can replace cast bowl but the clips and bale often mangled or missing. Lately the cork&rubber gaskets used for my glass bowls' has been disintegrating causing leaks probably due to modern gas formula. 1904's can be good performers and YF's probably will perform well if in decent shape. 1904's individually are notorious for warpage, worn out mechanicals and swapped internals ( bad cores sold online as "used"?). 1904's will provide hours of entertainment getting vertical bowl to seal, testing float levels under pressure and drivability/performance. I'm a fan of the 1904 but caution that actual drive-testing each one individually is the only method I've found useful to confirm performance before trying to get three to work together... The progressive OFFY linkage, ( smartly versatile ) uses primary/center "big" carb for idle and cruise so testing for drivability with outers' blocked is highly recommended. I have collected "a few" over time to mix and match to optimize performance/drivability and find that grimey dirty old truck type often runs better than an expensive NIB shiny one. I think he meant 1904, the 1940 is a completely different carb. My apologies. I’m not to familiar with the Holley’s but I think I figured out the two on the outside are 1908’s and the inside is an 1904. I don’t think I’ll be using the 1904, I think I’m looking for a 1908 big venturi with an electric choke (if such a creature exists). After combing through the articles it appears that neither is really a good choice (Holley or CYA’s), folks seem to like the Weber 34’s. I do like the look of the Holley’s but I would have to sell all my carbs and start from scratch. I won’t be needing the spark control valve either, wondering if they can be eliminated? Looks like I have a bit more research to do. This is a write-up I did a few years back on my '66 Ranchero. It's one man's experience. I'm sure there are typos and sentences that are unclear (make sense to me but not the reader). Please send me you suggestions, corrections and criticisms. I'll make the changes. jahearne wrote: This is a write-up I did a few years back on my '66 Ranchero. It's one man's experience. I'm sure there are typos and sentences that are unclear (make sense to me but not the reader). Please send me you suggestions, corrections and criticisms. I'll make the changes. nice write up. i especially like the suggestion of the weber one barrel carbs. something i never even thought of. It came with very little linkage, some of it's usable the rest is headed toward the bin. I like your linkage, reminds me more of a BMW style setup (think e30 M3). Looking at the offy supplied hardware ($100 for the parts kit alone, I priced it) it doesn't look like precision pieces, they look fairly floppy. I have not seen or touched one in person but I've worked on a few dual carb cars and bikes and I believe you are on the right track. With offy parts kit, we are talking 1960's tech. I've saved off the pic for future reference, hope you don't mind. So why didn't you go with all ict's vs. the autolite? Besides being gorgeous beyond belief, check out this triple linkage. That’s a bute! Really-really neet setup! I’ve been doing some research and found a few kits that should be able to be cobbled together to use for our Offy setup. See links below. The price might be prohibitive (shipping from Australia) but the concept is spot on. I’d like to find a hex-rod and hex-heim joint setup stateside, then buy all the bits and pieces separately, unless somebody is making a kit. it got a nice flow. http://www.youtube.com/watch?v=2i-Lnph9 ... detailpage (part3)running motor.